If you’re a homeowner who cares about the survival of your lawn, trees and perennials, it may be time to break out the hoses. We’re not talking about looking good; we’re talking survival, especially for young trees, says Jeff Iles of the horticulture department at Iowa State University in Ames. The Quad-Cities ended 2011 about 3 inches short of normal rainfall for the year and is 7 inches below normal so far this year. 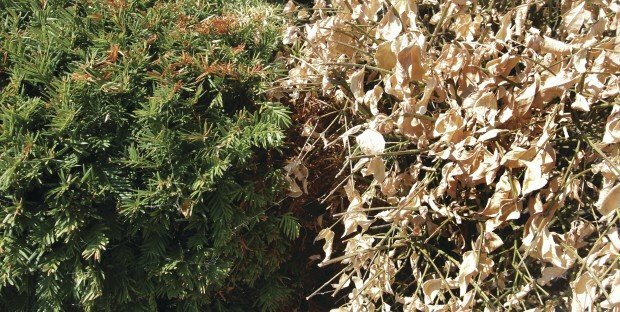 Add in the abnormally warm March that got plants taking up moisture a month early along with the hot temperatures we’ve had this summer and plants are hurting, said Ray Wolf, a meteorologist with the National Weather Service in Davenport and an Iowa State/Scott County Extension Master Gardener. Here is what you need to know for your vegetation. Lawns: Most Kentucky bluegrass lawns have gone into dormancy, and that is OK for about six weeks, said Bruce Branham of the University of Illinois Extension. Any longer and the roots can begin to die, he added. Many Quad-City lawns began going into dormancy during the first part of July, and because we haven’t had much rain since then — just 0.45 of an inch in Moline during the entire month of July — it may be time to water, Wolf said. After six weeks, give your lawn about one-quarter of an inch every two weeks, Branham said. You don’t want the lawn to green up, just survive. To check for the amount of water your lawn is getting from your sprinkler, set out several empty tuna cans within the spray pattern, said Duane Gissel, a horticulturist with ISU Extension/Scott County. If you let your lawn go without water, you probably should think about reseeding this fall, Burrows said. On the other hand, Nick Christians, a turfgrass specialist at Iowa State, has a lot of faith in Kentucky bluegrass and thinks most lawns will survive without watering. He said that during the drought of 1988, central Iowa lawns went dormant in May and did not recover until well into September. “I was amazed by how well the turf recovered in the fall (of that year), even on areas that had been dormant for 15 weeks or more,” he said. “I am betting this year that … most people will be surprised by the recovery when temperatures cool and the rains return,” he said. So, it’s a homeowner’s choice. New trees and shrubs (planted in the last three years): Because these plants have small roots, the most important place to check for water need is in the rootball or root-mass, not in the surrounding backfill soil, Iles said. Until roots grow into the backfill soil, moisture in the rootball or root-mass can be depleted very quickly. Requirements will vary by site, but with temperatures hovering around 100 degrees, daily irrigation may be in order, especially for plants on open, exposed sites, he said. Apply water slowly near the base of the plant and over the developing root system. Water applied too rapidly will be lost through runoff. Two to 4 gallons per inch of trunk diameter is a good rule of thumb. A shallow layer (2 to 4 inches) of organic mulch (wood chips, shredded bark) spread over the planting site will help conserve moisture. Established, mature trees: A single large tree can transpire away more than 100 gallons of water on a typical summer day, and they have to get it from somewhere, Iles said. 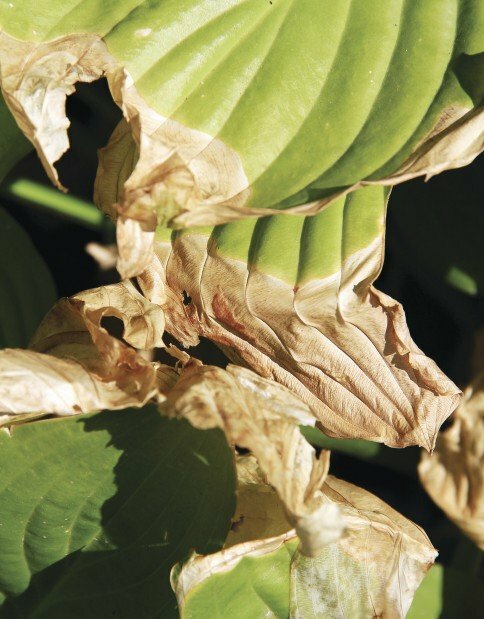 If your plants are showing symptoms of moisture stress (wilting, yellow leaves, and/or scorched leaves) apply water with an oscillating sprinkler set at low pressure (preferably when winds are calm) until the soil is wet to a depth of 18 inches, he said. Or use soaker hoses or a steady, thin stream of water from a regular hose. Burrows advises homeowners to invest in several soaker hoses and use those to water, especially trees. These are hoses with small holes that allow water to ooze out, meaning that it all goes into the ground rather than running off. Burrows suggests you put these hoses around your trees at the drip line (where the branches end) and just beyond when you go to bed at night and then allow the water to run all night. Many people likely will blanch at the thought of water running all night — and the subsequent water and sewer bills — but weigh that against the value of the tree, she said. Not only do trees shade your house and reduce cooling costs, but they also add value to the looks of your home. And removing dead trees is expensive. If you don’t want to water to a depth of 18 inches as Iles suggests, then water to at least a depth of 4 to 6 inches, Burrows said. “It takes a tremendous amount of water (to resupply the soil) when we’ve let it get this dry,” she said. Use a trowel or shovel to dig into the ground to check the moisture level. Hedges: Many people have hedges, which are plants located close together with masses of roots in one place. “A lot of people probably haven’t watered their hedges in years,” Burrows said. Put down your soaker hose and let it run one day on one side and another day on the other, she said. Perennials (flowers): Again, plants need about an inch of rain a week to keep going. If your perennials are mulched, pull the mulch back when watering so the water goes directly into the soil and not into the mulch, said Martha Smith, a horticulturist with the University of Illinois/Rock Island County Extension. If you’re watering plants on a slope, place the hose uphill on a slow trickle rather than at the base, she said.